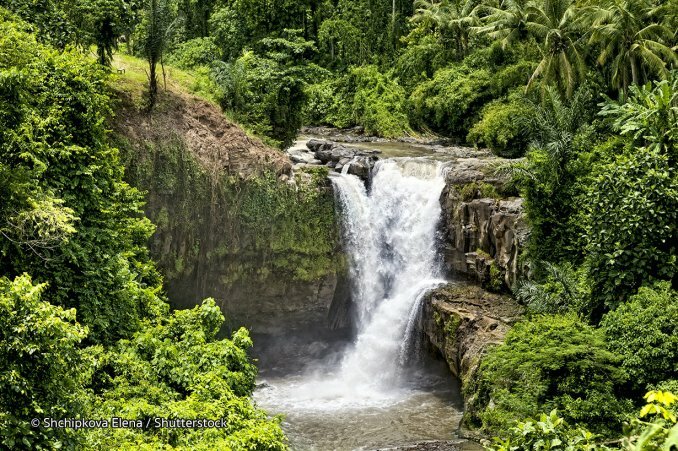 These falls are conveniently located halfway between Ubud and Bali’s provincial capital of Denpasar, and is considered the closest natural attraction of its kind that you can reach within only a half-hour transfer southeast from Ubud town. Getting to the falls is a pleasant drive down paved village roads lined with stretches of green rice fields on both sides. To get to the falls, you follow down a trail beyond rows of souvenir shops, with green valley panoramas in view. Dense foliage frames the falls, and the water volume is impressive at almost any time of year.